I grew up the youngest of six, four years between me and my next older sibling, the other five kids smashed within six years of each other. Being the youngest, and the runt of the litter, meant I got a lot of love and affection. One brother liked to feed me and change my diaper, even though he was only six years old. But being the last of four boys and two girls also meant I was on the receiving end of plenty of teasing and torment. My sister likes recounting the story of her and her friend coming home late at night, waking me up to get ready for morning swim practice and, still half asleep—being the obedient child—I followed her order. When I realized it was the middle of the night I started to cry. I was labeled forever a “whiner”. One brother in particular liked to make me sandwiches, especially ones with lots of knuckles. He gave me my share of noogies and charley horses. Recently, he proudly and humorously recalled the time he hit me, once sharply in each bicep with a protruding knuckle, paralyzing both of my arms leaving them limp and useless at my sides. I was a tough and rumble tomboy, however, and I took my revenge delivering my best sucker punch or surprising him with a bucket of cold water in the shower. On one memorable night out to dinner, the eight of us sitting around a large table, Lazy Susan in its center, one of my brothers lovingly coated a toothpick with hellishly hot Chinese mustard then disguised it with sesame seeds enticing me to lick it off. I shrieked; I was only four. Sometimes my siblings feigned altruism, like paying me fifty cents to mow the entire lawn, all one plus acres of it, or kindly passing me the non-fat powdered milk when there was no more than an inch of sludge left at the bottom of the plastic container. 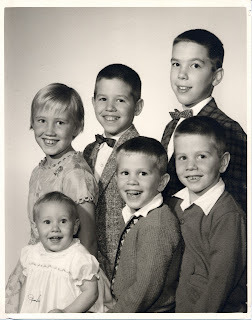 On occasion, however, my siblings were wonderful, letting me watch The Partridge Family instead of Kung Fu, or driving me to the hospital when I fell off of the swing and broke my arm, or teaching me the fine art of thrift-store shopping or inspiring me to swim the fastest race of my life. Thanks to my sibs, and luckily for Calvin, I never give up in the face of adversity. I roll with the many punches that life delivers, I never throw in the towel and though I get knocked down, I get right back up and I never get knocked out. And believe me, after years of practice, I’ve developed a pretty mean right hook, so watch out.